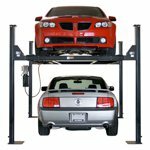 Choosing a car lift for your home garage: buyer's guide to four post lifts, two post lifts, in-ground, and single post lift systems reviewed and compared. To Lift or Not Lift That Is The Question! With the price of car lifts dropping under $2,000 in the last few years, many are considering the purchase of a car lift for two general reasons, storage and/or maintenance. When choosing a lift, you essentially have four basic types of lifts: four post, two post, in-ground, and single post lifts. While each has its own advantages and disadvantages, it is unlikely that the homeowner will have an in-ground lift and therefore that type won't be considered here. Nor will specialty scissor lifts, portable lifts, or other hybrids be discussed. That the four post "footprint" is generally smaller than a two post lift. Another couple small advantages of the four post lift are that most four post lifts have caster sets available which allow you to roll the lift around the garage, and if you are putting a second car under the lifted car, most four post lifts have drip trays to catch the wayward carbon footprints of our vintage cars. Yet another advantage to storing a car on a four post lift is that it doesn't leave the car with the suspension hanging down over a long period of time. However, maintenance on a four post lift is not as convenient as on a two post because you are forced to work around the ramps and in some instances will have to use a jacking tray to elevate the car off the ramps to perform maintenance. The usually have a larger footprint that the four post. Also, when used for "stacked" car storage, there is no easy way to catch or prevent drippings from the lifted car reaching the bottom car. 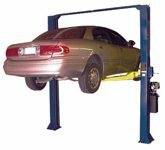 Single post lifts are a more recent development in car storage and maintenance. The single post lift has the advantages of long term storage for cars since the cars are parked on ramps, and this type of lift generally does not require being bolted to the floor. However, this type of lift is the worst for vehicle maintenance as they have two obstacles to overcome, the ramps and the support beams that do the lifting. Not to mention that their cost still is several times higher that two or four post lifts. Now that you have mentally decided upon what type of lift that you want, PLEASE consider the following as well. While various manufacturers and their salespeople will tell you that their lift is the best and that the other companies are a piece of junk, listen to what the sales people have to say, discount the rhetoric, and you will eventually come away with kernels of information to help form your decision. When researching the web about a particular lift, you will find people on the various bulletin boards who will swear by a lift and those who will swear at it. Remember that everyone comes from a different perspective; it's like the old Ford vs Chevy argument. Try to separate the truth from the opinion. Pay attention to the necessary power requirements of each lift. Some come with 110V, some with 220V, and some with your choice of electrical power source. Pay attention to the necessary anchoring requirements of each lift. Most lifts require that you have a 4 inch concrete slab. This will cover the majority of home use lifts. Many lift users will remind you to pay attention to the quality of the steel that is used to manufacture the lifts. As with anything, there are varying thicknesses and steel grades amongst the manufacturers. Check with the manufacturer about replacement parts. Having a lift is meaningless if you can't replace a worn or broken part. If you are not comfortable about installing a lift yourself, check to see if a local contactor is available to install it for you. This service may cost you several hundred dollars. Also check transportation costs to get the lift to your house. Regardless of what type of lift you choose, do your homework on all the brands in that category. You may find that the lift that you are looking at is actually a spin off of another company. For example, Direct Lift is a spin off using Rotary Lifts engineering. Find out if the lift is ANSI/ALI certified and ETL approved. This can either be done through the manufacturer, or by checking the http://www.autolift.org/ website. Some manufacturers will play down the need to certify their lift, usually because their lift isn't certified. My thinking leans towards safety. I want a properly engineered lift that has redundant safety features so that I do not have worry while I am under the lift. See if demonstration lifts are available in the area to go inspect. So, which lift should you buy? There is no perfect answer for everyone. Individual needs are diverse and dependent upon garage space, needs, personal desires, and available funds. Personally I chose a 4 post lift that allowed me to put 3 cars in a two car garage. If I had more room to store cars and was more interested in a maintenance only lift, I would have made a different decision. Maybe someday I'll have that heated 8 bay garage with 13 foot ceilings! Comments on "Car Lifts Compared"
I HAVE A EZ-CARLIFT BECAUSE OF THE HEIGHT OF MY GARAGE. Like Gil I ultimately chose my lift because of space restrictions and safety standards. My lift is a Direct Lift 8,000 lb standard lift, which allows me to stack two cars in a 10'0" garage. and takes up no undue space in the shop. Lukas, While it might work for you, I wouldn't consider that lift as it is on the wrong side of the ocean for me and wouldn't suit my needs. Just so you know, at the time that the article was written, scissor or specialty lifts weren't as readily available to the general consumer. With a four post lift, is there a problem opening an overhead garage door with a car on the lift while one is parked underneath it? Any lift positioned under an open garage door will require the door tracks to be raised. There are many ways to to make this happen, but you may want to involve a garage door installer. Revising the torsion spring lift mechanism can be quite dangerous. I bought a Direct four post lift and the reason I picked it is that, while made in China, the brand is owned by Dover who also makes Rotary lifts you will find in many auto repair shops. I figure that parts and quality will not be a problem. for the last 6 years it ahs worked flawlessly.